The Punjab and Haryana High Court wants to know from the Haryana Director-General of Police the details of police officials retained in service after having faced department proceedings in cases of moral turpitude and acceptance of illegal gratification. Haryana Chief Minister Bhupinder Singh Hooda attended the “chahallum” ceremony of the late Indian cricketer, Nawab Mansoor Ali Khan ‘Tiger’ Pataudi, at Ibrahim Palace here today. 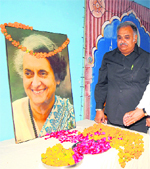 Congressmen paid rich tributes to former Prime Minister Indira Gandhi on her death anniversary at Sirsa and Fatehabad. The city today welcomed triplets (two girls and a boy) as the “symbolic” seven billionth babies, who were born to Mamta, a housewife from Moi Majri village in Sonepat. The woman gave birth to three healthy babies at the RP Stone Clinic to join the list of a select few women who gave birth to triplets. The infants were born in good health at 2.9 kg (girl), 2.6 kg (boy) and 1.35 kg (girl) from 1:36 pm to 1:39 pm during elective caesarean section. Haryana, the land of khaps and honour killings, has no human rights commission. Though there are human rights violations galore in the state, yet the Hooda government is dragging its feet on the constitution of a human rights commission, inconveniencing thousands of litigants and persons wronged by the state agencies, primarily the police. Rakesh Chhabra (40) and his son, Kurnal Chhabra (13),of Ganganagar Colony, Jagadhari, were killed when their motorcycle and a truck collided near Udhamgarh village on the Jagadhari-Chhachhrauli road last night. The arrival and procurement of paddy crop in various mandis of the district crossed 82,000 metric tonnes (MT) till this evening. This is nearly equal to the arrival and procurement that took place in the corresponding period last season. The inflow of chemicals and other effluents in the Ghaggar passing through Ratia town has become the bane of local residents. The polluted water of the Ghaggar, the residents allege, has been contaminating subsoil water in the area, exposing them to several health problems. A raid conducted by officials of the local Market Committee and registration of a criminal case against the kin of the owner of a cotton mill here has resulted in a row between the committee officials and the cotton mills and foodgrain dealers associations. A month after the death of a woman under mysterious circumstances, the police today booked her husband, father-in-law and brother-in-law for killing her for dowry at Ding in Sirsa. The state government has decided to make mandatory the Self-Certification System of approval of building plans in licensed residential or industrial plotted colonies for which license is granted under the provision of the Haryana Development and Regulation of Urban Areas Act, 1975. A record procurement of paddy has been made in the district during the current season with a total procurement of about 5.82 lakh metric ton (MT) till Saturday, Deputy Commissioner Neelam P Kasnai said. An Executive Engineer, a SubDivisional Officer and a foreman of the Dakshin Haryana Bijli Vitran Nigam were assaulted by angry villagers in Milkpur village of this district today. The villagers were angry over the death of a buffalo after it came in contact with a live power cable dangling from a pole. Bimla of Akanwali village was adjudged the Best Mother of Fatehabad block and she won a cash prize of Rs 1,000 under a scheme to encourage good rearing of children especially the girl children. Days after a strike ended at automobile major Maruti-Suzuki's plant at Manesar, the state government has said today that the practice of employing contractual labour in the state could be discontinued. The police has arrested Rajesh, alias Raja, of Bibipur in Jind district, who along with his other accomplices, was booked for allegedly shooting Virender Singh, of Kakdod village, in Jind district, to death on the university campus here on October 17. The Uttar Haryana Bijli Vitran Nigam has decided to open its cash collection centres in Panchkula, Ambala, Yamuna Nagar, Kurukshetra, Kaithal, Karnal, Panipat, Sonipat, Rohtak , Jind and Jhajjar districts tomorrow (Haryana Day) and on all Saturdays of November, which are otherwise holidays. The Dakshin Haryana Bijli Vitran Nigam (DHBVN) has changed the timings of power supply to industries and agriculture tubewells. A DHBVN spokesman said here today that the agriculture feeders would now be given power for eight hours a day in two groups. Group- 1 in all operation circles will get supply from 10 p.m. to 5 a.m. and from 4 p.m. to 5 p.m. daily while group-II in all operation circles will be given supply from 8 a.m. to 4 p.m.
Class III and IV employees of the Excise and Taxation Department in the state will launch an indefinite fast on November 8 at the state headquarters in support of their demands. Going into the background of the controversy, Justice Grover asserted, “This court has come across several writ petitions in which the members of the police force, who have been held guilty of accepting illegal gratification, have been confronted with the orders of dismissal, which in appeal or revision have been overturned by taking a lenient view and imposing punishment of stoppage of a few annual increments. Already, the high court has directed the removal of police officials convicted for criminal offences. Less than a fortnight ago, the Bench of acting Chief Justice MM Kumar and Justice Rajiv Narain Raina had also stayed the operation of a circular issued by the Punjab Director-General of Police on May 18, 2010. The DGP, vide the circular, had directed all appointing authorities in the Police Department not to remove a police official convicted for a criminal offence for which the sentence prescribed under the IPC is less than three years. The DGP had also recommended leniency against them. Describing Pataudi as a fine human being and a renowned cricketer, Hooda pointed out that the late Nawab always used ‘Pataudi’ suffix with his name though he was born in Bhopal and educated in Dehradun and London. He recalled that despite having lost an eye in a mishap, Pataudi went on to become the captain of the Indian cricket team and held the position for 13 years. He was honoured with the Arjuna Award as well as the Padma Shri. Representatives of 52 villages, which fell under the erstwhile Pataudi estate, tied a ‘pagari’ on the head of Nawab Pataudi’s son and Bollywood actor, Saif Ali Khan, and informally crowned him their 10th Nawab though the tradition is no longer in existence. Saif’s mother, Sharmila Tagore, and aunt Begum Sher Ali Khan blessed him while Maulana Mohammad read out the “rahamat-e-namaz” at the ceremony. Nawab Pataudi’s daughters, Saba Ali and Soha Ali Khan, former Indian cricketer Bishan Singh Bedi and other friends and members of the Pataudi family were also present. Later, the Chief Minister also visited Pathredi village in Gurgaon district to mourn the death of former sarpanch Jahangir Singh, who passed away recently. There, a number of residents of Langra village raised the issue of encroachment on the circular path of their village. The CM directed the local Deputy Commissioner to get the encroachments removed. Haryana Minister of State for Sports Sukhbir Singh Kataria, Congress MLAs Rao Dharampal and Aftab Ahmed, Deputy Commissioner PC Meena, Police Commissioner KK Sandhu and DCP (East) Maheshwar Dayal were also present. District Congress Committee president Malkiat Singh Khosa and Block Congress president Bhupesh Mehta paid tributes to Indira Gandhi at a simple function held in Congress Bhawan at Sirsa. HPCC delegates Gobind Kanda and Hoshiari Lal Sharma paid floral tributes to Indira Gandhi at separate functions held in their respective offices. SDM Roshal Lal paid tributes to the former Prime Minister at an official function held in the local mini-secretariat. Fatehabad: District Congress Committee president Randhir Singh and Block Congress president Tek Chand Midha paid tributes to Indira Gandhi at the local Congress office . SDM Baljit Singh paid floral tributes to Indira Gandhi at an official function held in the mini- secretariat. Reports of tributes having been paid to the former Prime Minister were also received from Sonepat. Speaking about the birth of the triplets, Dr Renu Gupta, who conducted the caesarean section, said the patient was admitted in the hospital 10 days ago. She had high blood pressure, which was common with multiple pregnancies. The doctor said in order to achieve term pregnancy to avoid the complications of premature birth, Mamta was kept under special care and she gave birth to three healthy babies. The C-section was performed on 37 weeks of gestation, which in itself was a big achievement for the mother, Dr Gupta said. Meanwhile, unaware of the fact that his babies could be the first triplets of among the seven billionth babies of the world, Rajesh said they were buoyed by the blessings of the almighty and were busy planning the future of the three infants. The indecisiveness of the state government, apparently in violation of the Protection of Human Rights Act, 1993, on the question of constituting a human rights commission has left the state residents high and dry, who have no option but to travel to the faraway National Human Rights Commission (NHRC) in New Delhi for the redressal of their grievances. While there are no official figures about the human rights violations in the state, Arvind Thakur, chairperson of the Global Human Rights Council (GHRC), Chandigarh, claimed that over 13,000 complaints from Haryana were pending with the NHRC. Thakur claimed that state agencies, especially the Haryana police, were major violators of human rights. However, what has irked the residents is the fact that repeated representations to the top state functionaries have fallen on deaf ears. The GHRC has sent repeated representations to Chief Minister Hooda, but to no avail. Nand Lal, a resident of Karnal, alleged that he was having problems in renewing his ration card and it was difficult for him to approach the NHRC. RP Malhotra, state convener of the human rights cell of the BJP, who recently sent a memorandum to the Haryana Governor, asserted that a spurt in the human rights violations in the wake of an increasing crime rate had necessitated the constitution of a human rights commission. “Honour killings, the questionable role of khap panchayats and atrocities on Dalits and minorities should wake up the state government from its slumber and it should spare a thought for human rights violations in the state,” Malhotra asserted. While all neighbouring states, including Himachal, Punjab, Rajasthan, Uttar Pradesh and New Delhi, have human rights commissions, Haryana has the dubious distinction of not having a human rights panel. There are 15 human rights commissions in the country and all major states have their separate human rights panels. The deceased were returning home after closing their karyana shop when a truck hit their vehicle killing them on the spot. According to the police , the truck was on its way from Jagadhari to Paonta Sahib. The police shifted the bodies to the Civil Hospital for a post-mortem examination. The bodies were handed over to the victims’ family. A case has been registered against the truck driver. According to officials sources, the total arrival of paddy includes 50,000 metric tonnes of Grade A of the crop besides 19,000 MT of basmati and 11,000 MT of the ‘muchhal’ variety. The procurement of the ‘sharbati’ variety has been over 2,800 MT so far, claimed the officials. The leading procurers include the Food and Supply Department, which has procured around 21,000 MT, followed by HAFED with over 17000 MT, Haryana Agro 11,500 MT and Haryana Warehousing Corporation around 500 MT so far. The private mills have purchased around 3,800 MT. Narwana mandi has been leading in the arrival of paddy with around 25,000 MT of the crop reaching the market till Monday, Safidon had an arrival of around 16,000 MT, Dhamtan 12,000 MT, Jind 8,500 MT, Dhanori 4,300 MT and Pillukhera 6,500 MT. The mandis in the district also saw arrival and procurement of the bajra crop totalling about 1,860 MT so far. The authorities, while claiming that there was no problem relating to procurement of the bajra crop in the district, asked the farmers to ensure that the crop was properly dried and cleaned at the time of arrival in the market. The Paryavaran Bachao Manch, a local organisation working for environmental protection, has written to the authorities several times drawing their attention towards the problem, but to no avail. Several other organisations have now written to the state government providing a solution for their problem. The residents alleged that the inflow of chemicals and industrial waste from different towns of Punjab located on the Ghaggar on the upstream of Ratia had been dumping their waste in the river, much to their detriment. The residents have demanded immediate end to the inflow of chemicals and industrial wastes in the Ghaggar to save them from getting ill.
DB Batra, Regional Officer of the Haryana State Pollution Control Board (HSPCB), Hisar, admitted that the Ghaggar was being polluted from the industrial wastes in Punjab, before the river entered from Sangrur district of that state. He said the board had written to the Central Pollution Control Board (CPCB) several times in this regard. The sampling of water in such cases had to be done jointly by the teams of the CPCB, the HSPCB and the Punjab State Pollution Control Board. He added that the authorities delayed the sampling due to the rainy season earlier, and it was due to be done anytime now. Batra, however, maintained there was no pollution from industries located in Haryana in the Ghaggar and all effluents came to it from Punjab side. The associations are staging a dharna outside the Market Committee office here, demanding withdrawal of the case and transfer of the secretary of the committee. While allegations and counter-allegations regarding the evasion of market fee by the mill management and the alleged irregularities in the action taken by the officials are being made, the members of the District Cotton Mill Association and the Foodgrain Dealers Association here staged a dharna in protest against the police action and the raid conducted by the officials of the District Market Committee at the Baroda Cotton Mill here on Saturday. Though the officials claimed that the action followed reports and complaint of tax evasion by the mill, the mill owner and the District Cotton Mills Association described it as a “false” allegation. They claimed that the action was a part of the drive launched by certain officials to defame and harass the mill on baseless grounds. The police had booked a case against Mukesh Jain, kin of the owner of the mill, after a complaint was lodged by the secretary of the Market Committee that the team of officials that went to the mill to check the records regarding the payment of market fee was not only prevented by the accused and his men to carry out the job, but were also threatened with dire consequences. The victim, Manju (25), who lived with her husband, Sanjay, brother-in-law, Billo and father-in-law, Munshi Ram, a junior engineer in the DHBVN, at his government quarter in Ding, died on October 1. She was taken to a government hospital here with suspected poisoning and was referred to the PGIMS, Rohtak, but she died on the way. After the victim’s brother, Rohtash, lodged a complaint demanding probe into her death, it was found that Manju’s in-laws had cremated the body without a post-mortem examination or even informing the police. The police has booked Sanjay, Munshi Ram and brother-in-law Billo under Section 304-B, IPC. TC Gupta, Director-General, Town and Country Planning Department, said this self-certification policy would be applicable to the individual plots of plotted residential or industrial colony. Henceforth, no building would be constructed without following mechanism of self-certification and violation of the same would not be compounded under Section 14 of the Punjab Scheduled Roads and Controlled Areas Restriction of Unregulated Development Act, 1963. He said in the due course of time, five model building plans for each category of the plots of residential plotted colony would be hosted on the website of the department i.e. www.tcpharyana.com <http://www.tcpharyana.com>and also would be available in the office of the District Town Planner concerned. If an allottee of the licenced plotted colony wanted to adopt one of these plans, the same could be straightway adopted and as such he would be saved from cumbersome process of getting them approved from an architect and submitting the same by undertaking so many formalities. Gupta said by switching over to 100 per cent self-certification system of approval of building plans, it was hoped that it would bring substantial relief to the allottees of licenced colonies and the compliance of rules and regulations would also increase because the department would concentrate more on ensuring compliances instead wasting its resources on approving these building plans. The necessary amendment in this regard in the Punjab Scheduled Roads and Controlled Areas Restriction of Unregulated Development Rules, 1965, were being carried out. The decision would be effective from November 1. The state Food and Supplies Department purchased 2.41 lakh MT of paddy while the other government agencies like HAFED, Agro, Haryana Warehousing Corporation and CONFED purchased 1.84,486 MT, 54,494 MT, 13,479 MT and 7,526 MT of paddy, respectively. The share of millers and dealers in the purchase at the rate fixed by the government was only 80,718 MT. The villagers reported to DHBVN officials last night that one of the cables had broken and was dangling from a pole. However, no official reached the village. The villagers blocked traffic this morning. When DHBVN officials reached there, the villagers beat them up. The victims included XEN KD Bansal, SDO Jagir Singh and foreman Puran Singh. Kamlesh from Chablamori and Rajni from Ahlisadar won second and third positions, respectively, and they were given cash prizes of Rs 750 and Rs 500, respectively, for their feat. Under the scheme, started by the Women and Child Development Department, cash prizes for Best Mothers are given at the circle and the block levels to those women only who have at least one daughter. At the circle level, the cash prizes are Rs 500, Rs 300 and Rs 200 for the mothers coming at the first, second and third positions, respectively. Dr Poonam Raman, Programme Officer of the department in this district, gave away the prizes to the winners. She said according to the eligibility criteria, the age of the mothers should be 18 years at the time of her marriage and the birth of all her children should be registered with the appropriate authorities. The immunisation status of her children should be completed according to schedule and she herself should have also been fully immunised with tetanus toxide. Shiv Charan Lal Sharma, Minister of State for Labour and Employment, said concerted efforts would be taken in the interest of workers to remove the practice of employing contractual labour in the state. The minister was interacting with representatives of the Haryana region unit of the All-India FCI Workers Union and the Food and Allied Workers Union at Faridabad, a spokesman said. The police said Vijay had already been arrested in connection with Virender’s murder. Rajesh was arrested when he fired on a police party near Ismailpur T point in the district on Saturday. Rajesh confessed that he was involved in eight criminal cases. One pistol and two cartridges had been seized from his possession. Rajesh was also involved in a number of murders in Jind, Kaithal and Kurukshetra, including the recent murder of Joginder, a resident of Dhamtan village in Jind. The police initially believed that Virender was a MA (philosophy) part-I student but investigations revealed that he was not a student of the university and had been staying in a hostel on the university campus illegally. Rajesh is currently in police remand. According to employees’ leaders, the demands include abolition of three years eligibility criteria for promotion from the post of Assistant to Excise Inspector imposed since 1998 and creation of more new posts of inspectors, processors, assistants and clerks.